Truly, all things in life come full circle. Nothing could be more accurately said, especially when it comes to Danielian Associates. DA has a rich history among California’s architectural elite. The firm’s founder, Art Danielian, FAIA, began his career working for Ed Fickett who pioneered many of the design concepts collectively known as Mid-Century Modern. Today the firm is being led by a new generation of architects and planners. Staying true to their roots, the Danielian Team is leveraging their extensive history with this increasingly popular design style and crafting its own “modern” spin on modern design. “Everyone loves contemporary design right now and we often talk about transitional styles, so it is probably very fitting that our firm itself is in a transition phase” said John Danielian, Principal of Danielian Associates. “We have a great team of very experienced designers and lots of young talent in our office. In collaboration with our wonderful clients, Danielian Associates will have a great showing at this year’s PCBC Gold Nugget Awards – but it is truly just the tip of the iceberg. We have lots of very exciting projects in the works,” John said with a big smile. Built by Habitat for Humanity, designed by Danielian, and developed by Peninsula Publishing, this project took on a special meaning from the start with its future owner slated to be a military veteran. The City of Fullerton required that the home pay homage to local Eichler-styled homes and Mid-Century Modern roots. Skillfully led by Senior Designer and Associate Louis Bretana, the Danielian team jumped at the challenge. A nod to mid-century modern vernacular paired with new building technology, the home has a small footprint yet it still achieves California style outdoor living with the deck off the upstairs family room designed as a roof garden. The multi-generational component acknowledges the challenges of affordable housing for an increasing number of families. The accessible adaptable unit was designed to allow for separation and privacy. The high ceilings, strategic window placement, and roof lines serve to collect rain water in the rainy winters and facilitate passive cooling in the warm summer months. Designed with sustainability in mind, much of the building materials were locally sourced, repurposed, and/or donated. In addition, the home was staged using “healthy” and sustainable materials and furnishings, much of which was donated or reused. 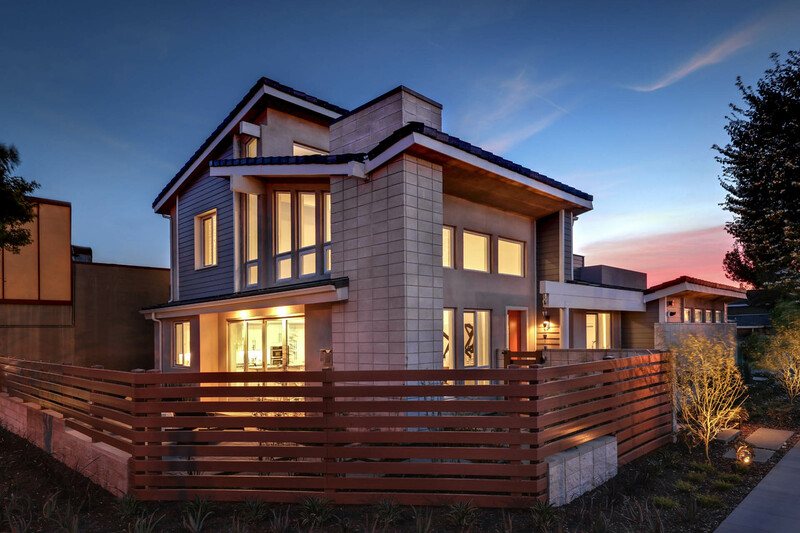 Incorporating mid-century modern architecture with new building technology, this affordably built NZE ready home is targeting LEED Platinum, Energy Star, Indoor Air Plus, Water Sense, and will be the first home certified under the Wellness Within Your Walls in California. Jamboree Housing had an incredible corner location in Buena Park for their Clark Commons project. The challenge presented to the design team was that it would be located within a surrounding, market rate master planning community also being developed. This amenities-rich, 70-unit apartment complex now provides safe, affordable housing for local families with seamless integration into the master planned community. Edging a major urban revitalization district, this project’s creative design balances vibrant, pedestrian-friendly streetscapes with a contemporary design flair and commercial aesthetics, like double volume storefront windows. The client’s primary goal was to encourage advancements in academic achievement, career development, and an increased quality of living for this community. Leading the Danielian design team was Principal Mike Boyd, AIA and Senior Project Manager and Associate Mojgan Momenan. A large, collaborative team effort produced inviting open floor plans with private outdoor decks and flexible living spaces. These energy efficient, LEED GOLD, affordable housing units introduce market-rate quality apartments for the surrounding hospitality, retail, restaurants, and auto repair shop workforce. A new public park borders first floor apartments allotting direct access via front stoops so mothers can supervise their children during playtime. Private amenities include a podium level tot lot, outdoor seating, barbecues, fire pits, and picnic tables that will encourage family and community interaction. A job skills center is located within the ground floor retail component along with a culinary arts program, student café, after-school tutoring, and community assistance for both resident and non-resident use. GHA Companies selected Danielian Associates to design a modern take on the quintessential Desert Contemporary home. The challenged presented to the design team focused around strong architectural theming, as that was going to be a primary sales driver since these homes were being marketed to snowbirds and buyers seeking desert living lifestyle. In addition to the modern design, the plans had to feature a diverse and appealing street scene, open floor plans to allow for ample entertaining spaces, and flexibility to plot certain plans on both interior and corner lots – all within small lot footprints. Extensive client collaboration led by the Danielian design team led to these award-winning designs, headed up by Associate and Senior Designer Tom Wong and Senior Associate and Senior Designer Joe Digrado, AIA. This desert modern architecture compliments the site context and the open floor plan with indoor/outdoor living elements allow ample room for entertaining. By bringing the outside in within this small footprint, the home lives larger and make the interior spaces feel extra special. A first floor private bedroom is perfect for guests or multi-generational living. The master suite has a private deck with an extra-large closet and luxurious appointed bath while a secondary master suite is strategically positioned for scenic mountain views. The interior and exterior stylings flow seamlessly, bringing a cohesive contemporary design element and feel throughout.